There are many possible causes for these hellish episodes, and it's important to be educated on the whys and hows of PC crashes to prevent them in the future. After all, the next crash could be your PC's last. Following is a rundown of seven common causes and solutions. The Device Manager will show you devices with conflicts with a yellow exclamation point. Memtest86+ found some errors with this system. Not only is it gross, it's also killing your computer. You can monitor the temperature of your CPU with my favorite free monitoring tool, PC Wizard. In addition to other helpful uses, it will show you the real-time temperature of all your system components. The pea method for applying thermal paste. If you have recently installed a new CPU, the crashing could stem from a poor application of thermal paste. So remove your heatsink, clean your surfaces with a cotton ball and a little rubbing alcohol, and try again. There are competing theories on how to apply thermal paste, but your goal is always the same. The thermal compound fills the microscopic valleys on the surfaces of the CPU and heatsink to provide the most even and full contact between the two components. The paste is ineffective when too little—or too much—is applied. So I use the pea-drop method: I place a small, pea-size drop in the middle of the CPU, and then place the heatsink directly on top, letting the natural pressure of the heatsink spread the paste evenly. A 650-watt power supply should be adequate for most systems. If you determine your PSU can't handle the load of all your components, you have to make some difficult decisions. If you overclocked your CPU, you can return the processor to its original state. Otherwise, you can replace your power-hungry components for less needy ones, or follow the most sensible path and simply upgrade your power supply. A 500- to 650-watt power supply should be able to properly power an average performance PC. Defragmenting your PC is as easy as pushing a button. Fear the never-ending root folders! Starting in safe mode (press F8 while the computer is starting) is an easy way to go behind a virus' back to destroy it. Any information you can pull off a BSOD can provide a problem-solving clue. So when you get a blue screen like the one below, write down as much as you can, and search online for information on the error it's throwing at you. Diagnose the problem and get it solved, because ignoring the problem will make everything worse in the long run. 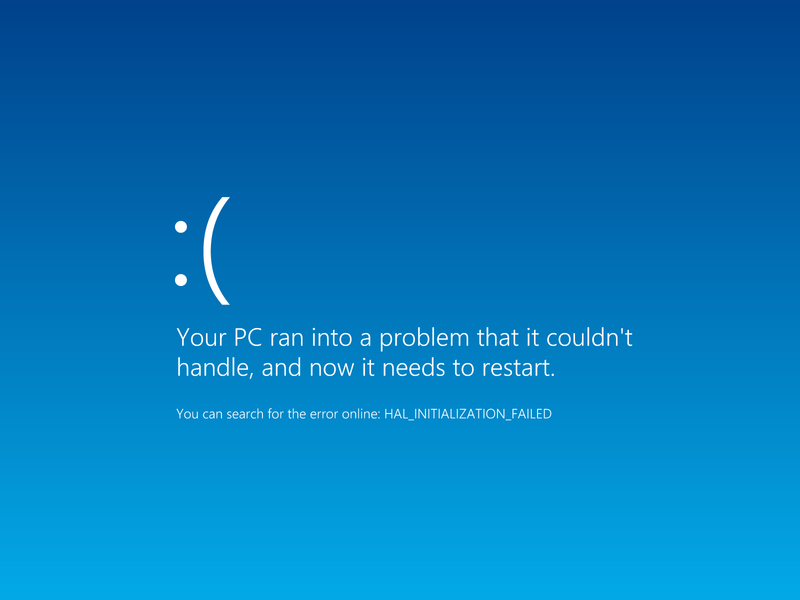 Windows 8 redesigned the BSOD to be more user friendly.